It seems like March just roared in and now it's almost gone! Yikes! I am behind in projects with a deadline. They are currently WIP. 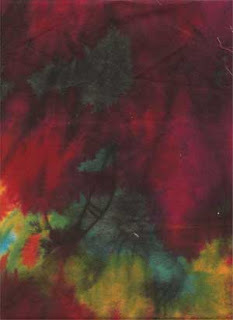 So, today I will add a picture of my first genuine art quilt. This one is "Trinity". I still love it and in fact have duplicated it. 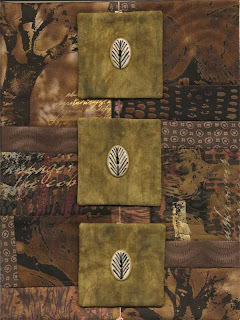 The version shown here is the journal quilt I made a few years ago. (sorry, not such a good photo...it's not really as crooked as it appears) It was displayed in Houston and in Chicago. Here is the interpretation of the quilt: The gold at the top represents the sun, next layer is the mountains, next, the flowers, trees, etc., then the soil of the earth and then the oceans. The three circles are the trinity which has reign over all the universe. It is machine quilted. There are beads on the circles. Ok, now to get busy again! I think this is one of my favorite pieces so far. I haven't decided on a name for it, yet, but it will come to me. 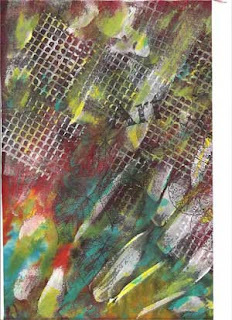 The size is 7 1/2" x 8 3/4". This is a result of using fabric I did not originally like. The maroon color fabric is a fat quarter that I had in my stash forever but never liked the color. The painted, stamped piece is a result of what I did to it. 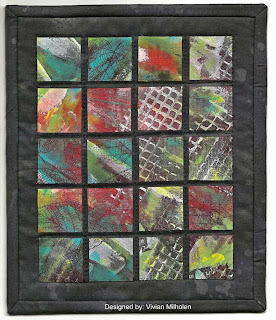 Then, I cut it into squares which made it much more interesting and placed them on a black background to make a quilt. Now I love it! It is machine quilted. I think I will do a series of these. On to even more exciting news: I am going to a seminar for starting your own business in my area. I want to find out all the legal details before I begin and this is the best way. There is so much paper work, licenses, tax info, etc. More later when I get closer to launching it. But it's a big step for me and my family will be glad I finally got started on it. They keep encouraging me to do this. Hooray! I'm so excited! My ATC is in this book! 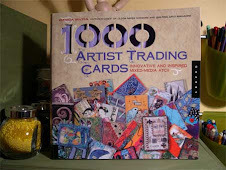 The book is 1000 Artist Trading Cards by Patricia Bolton, editor-in-Chief of Cloth Paper Scissors and Quilting Arts Magazine. My ATC is on page 199. It is full of ATC's of all sorts...really nice, pictures and instructions. I love it!! I pre-ordered mine from Amazon because I was moving and didn't want to chance missing it when it came out and it arrived today! I don't see it for sale on the Quilting Art website, yet. I did think before I sent in my ATC and took a picture of it as you can see here. I can't wait to see it in the bookstores. This is so cool! With our mail mix up due to the move, I was so afraid I would miss some important paperwork but I must not have, it's published!! I am currently signed up for two different inchies swaps. This is a picture of a sampling of one of the swaps. "Inchies" are 1" square works of art. They are made of paper, fabrics, paints, collages and just about anything goes. The ones pictured here (I made 20 of them) are made of a collage background of tissue papers, map images, paints and gel medium all backed on 140# watercolor paper. I then randomly embossed them with copper embossing powder. (I love using that heat gun.) Then, I edged them in copper leafing and gold leafing. 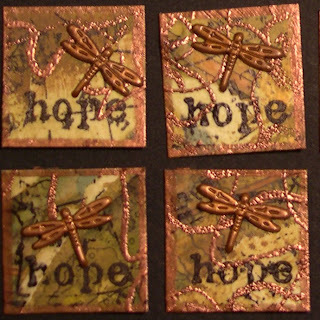 The word "hope" is stamped and of course I had to add the dragonfly. These are fun to do! 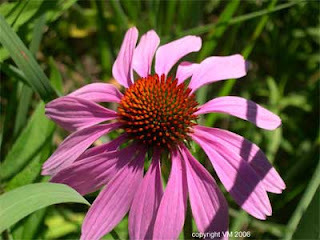 But I do find them very difficult to photograph. I tried scanning them, but due to shiny gel medium or objects, they don't scan well on my scanner. I can't wait to see the ones I get in return. If you do a google search for "inchies" you will be amazed at what you find. We have snow and ice on the ground and it is cold! This is the first time I remember having snow on St. Patty's Day. I hope we can get out today and have some fun! My DH is cooking pancakes for me and homemade syrup. Wearing my green! 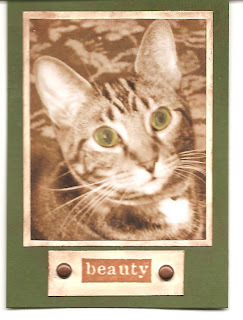 I had to include this ATC (2 1/2" x 3 1/2") because it is of our cat, Taylor. She has the prettiest green eyes! I used Adobe Photoshop Elements to turn the picture into sepia tone. Then, I used water color pencil to color in her green eyes. OK, this is green week for me! Don't forget to wear green tomorrow! 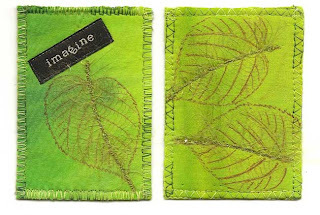 These two ATC's are made of fabrics, couched fibers and stamped leaf images. 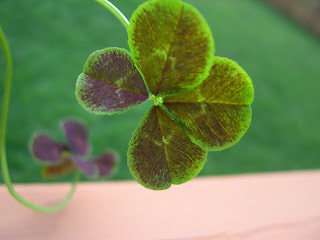 I had to post something green because St. Patty's Day is coming up tomorrow. I don't think we will do anything special...but hopefully will get to eat at Gordon Biersch Restaurant at Tyson's Corner. The weather is rainy and cold here today. What happened to the beautiful spring weather we had earlier in the week? I want sunshine! The good news is that next month we are flying out for a much needed vacation to sunny California...Santa Monica, that is! Our daughter and son-in-law and granddog, Betty Boop, are moving out there! Traci was offered a fantastic job and they decided to make the move! Her hubby will finish up his school year in Ohio (he is a teacher) and then they will move the household. She sends me emails to tell me how warm and sunny it is there...they are close to the beach...within walking distance! We can't wait for our visit there! I will be gone from April 20th to April 28th. Glorious days ahead! Don't forget to wear green tomorrow! This is a new quilt I just completed! It feels so good to finish something, finally! And I actually bought fabric today at G-Street to use on some more new work. This piece is "The Path". It reminded me of walking on pathways that were strewn with matted and crushed leaves. Before you know it, spring has arrived and just a few green leaves appear on the path. This morning, here in VA, it is snowing again. Schools were closed before even a drop fell. Now, there are beautiful flakes outside my window. These are two pictures I took while walking in the woods in OH one summer. 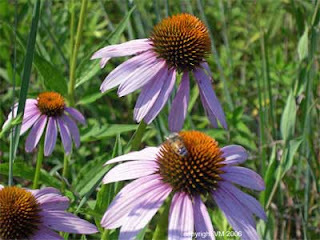 Just a bit of summer to warm us up on this cold, blustery day. I have just discovered that the entire month of March is National Women's History Month! Here is a website with great statistics. It started as a protest of factory working conditions in 1857. In 1909, it was observed as a day. It took Congress until 1987 to establish it for the entire month of March. If you take a look at the website, you might be shocked. For instance, in 2005, the median earned income for a woman working full time, year round, was $32,168. She only earned $.77 for every $1 a man earned. Back in 1967, I remember my mother, a widow, earned $60 a week working full time, year round, and late into the night. She also raised two dependent children on this amount. But she always managed, taking in extra jobs to help support us but it was very hard on her health. I know my mom's work experience doesn't have anything to do with the statistics but it makes me appreciate women who have her tenacity. 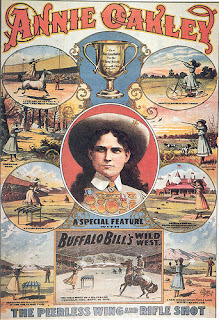 I just had to post this picture of Annie Oakley, my childhood hero. When I was small, I use to dress up in jeans, jeans jacket, holster with guns, cowgirl hat, ponytail and boots. I also told everyone that I was Annie Oakley's daughter and visiting my aunt (my mom). I embellished it with tales of living on a ranch in California. Yep, that's what TV did for me as a kid! Kudos to all the women in our lives who have influenced us one way or another! I just found out my quilt, "Moon River" (see below on Feb.27 post) was chosen as the Quiltfest winner for this week! I am so honored! It gets the honor of being on the homepage for a week! The web page is here . The group is CPS Journal Quilts. We are committed to making one journal quilt a month. The size is 8 1/2" x 11". 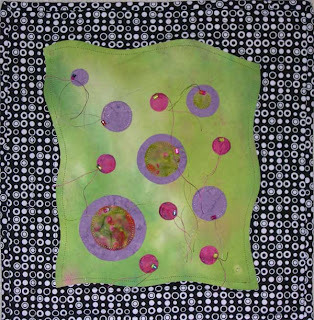 They are a wonderful group of art quilters. Just wait until the end of this year...what an art show there will be! So, just a happy dance today! This quilt is "Getting There". It represents my move and all the strings attached to it. The background is painted canvas from a class I took at QSDS. 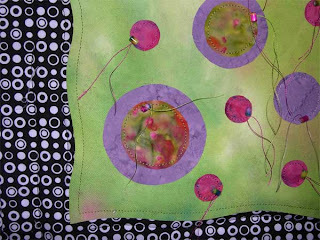 The circles are fused and machine stitched. 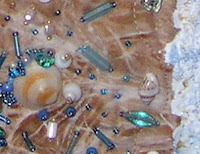 Of course there are the beads that seem to appear on all my quilts. Thanks to everyone that posted comments to Taylor and her quilting. Today she is happily sitting at the sliding glass doors to my studio watching "her" birds and chirping at them. One bird has even built a nest under the neighbor's deck that she can watch. I am going to buy a bird feeder for Taylor so she can have lots of birds to watch. 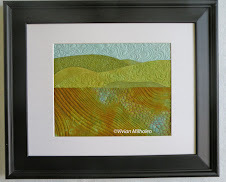 A small payment for such a great art quilter. I am working on a new quilt today. I bought some buttons around 5 years ago and have been waiting for the perfect time to use them. 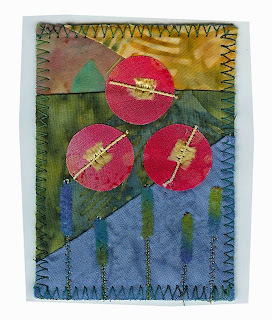 The class I am taking at Quilt University , "Self-Expressions" is really making me face the challenge of using what I have and why I don't use it. I have lots of "stuff" to work with here in my studio. I am also learning to use a timer when I work. I find I spend more time trying to make a decision, mostly changing my mind throughout the process only to realize I haven't progressed on the piece. If I give myself a limited time to say, choose the fabrics, then I can actually get on with the work. And I usually find I go back to my first decision anyway. OK, off to do some work. 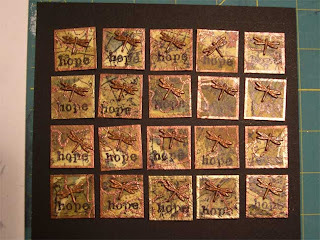 I may make a couple of ATCs to awaken my inner artist. Hooray! 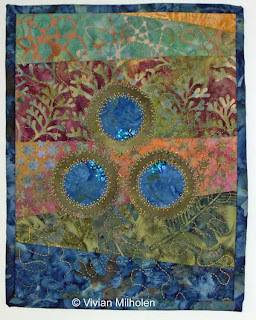 A happy dance because my quilt, "Serendipity II" was judged into the Sacred Threads quilt show! The show will be in June in Ohio. This picture is a tidbit...tiny corner of the quilt. Of course if you know me, you know it is another "beach" quilt.